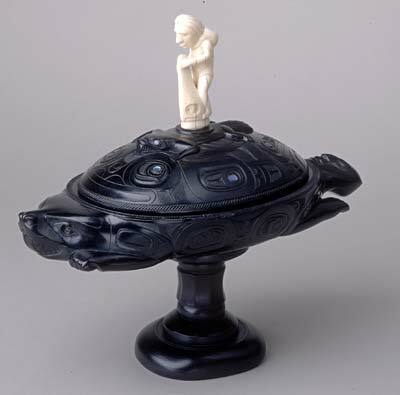 Argillite and ivory compote attributed to Haida master carver Charles Edenshaw. Height: 30 cm. Source: Liverpool Museum. I only have a short post today since I am up to my neck in alligators, courtesy of my day job. 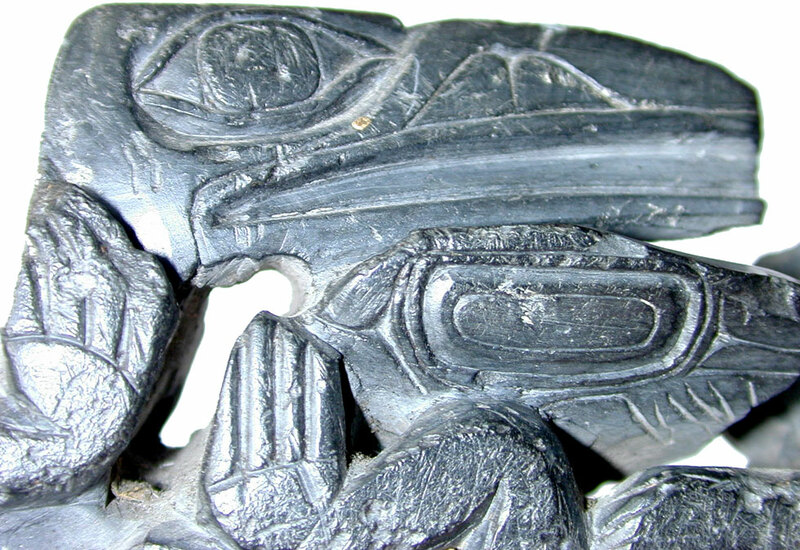 So, take a moment and check out the spectacular argillite compote (a pedestaled serving dish), attributed to Haida master carver Da.axiigang, Charles Edenshaw. This particular dish is in the collection of the Liverpool Museum – an institution that holds a collection donated by well-known coastal collector, casual ethnographer, and (apparently) former Liverpudlian, Dr. Charles Newcombe – many of the items in their Northwest Coast section must come from this source. 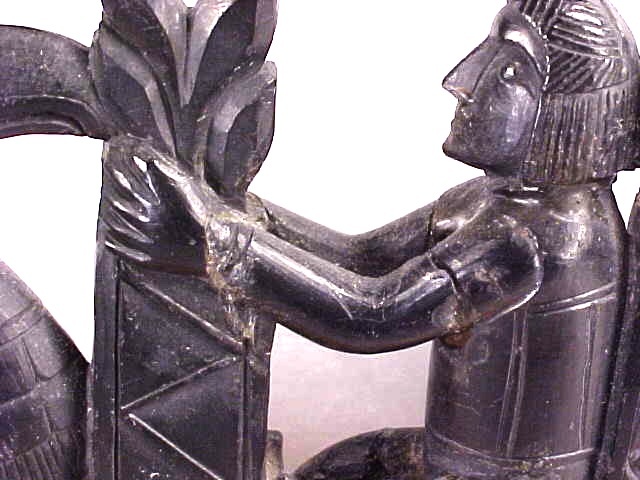 It is one of the more striking pieces of Argillite I have seen in that the form is so clearly derived from silverware: it is sublimely ridiculous, and I can’t help but feel that Edenshaw was in on the joke. Yes, he would make what would sell, but a piece like this makes me wonder if he wasn’t slyly pulling the touristic leg, somewhat. 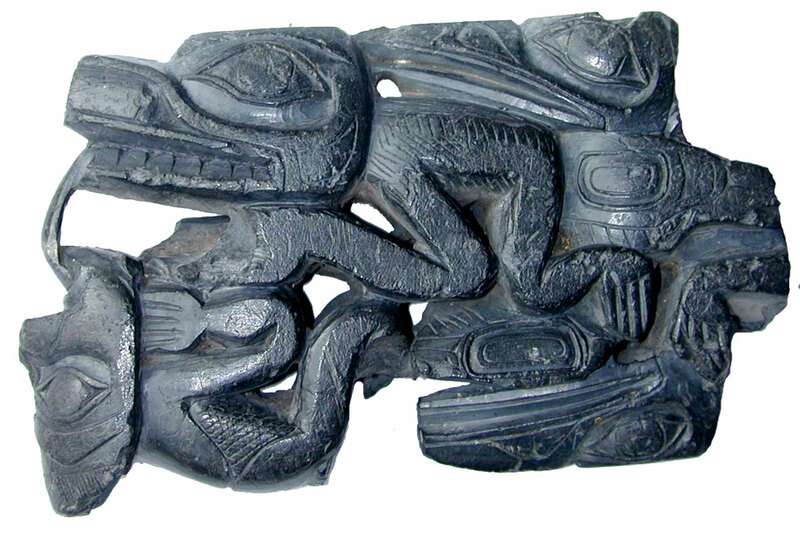 Haida panel pipe, nineteenth century. 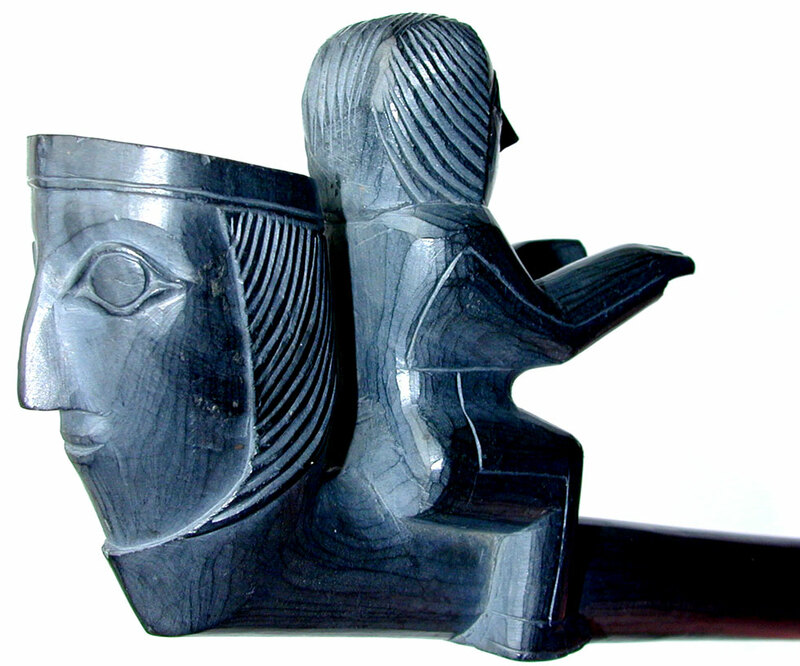 A few days ago I featured photographs of a stunning 19th century Haida argillite pipe for sale at a UK web site. They have a second pipe for sale, a more complex design but in poorer condition. 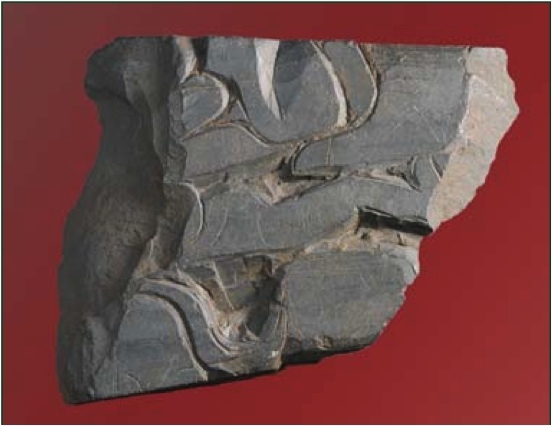 The photos are similarly revealing of carving strokes and rock grain; even more so in some ways as this piece appears to be unfinished. The design is complex focusing on Raven and Bear (not the Frog as the description below says, I don’t think), but it is not for me to try to decode the story being told. Probably from the Raven Tribe, the panel carved with various mythological figures including a raven, a man, a frog and the thunder bird, this is possibly part of a larger panel and the top has been slightly filed flat for mounting on a stand, (not photographed). Overall 13.5cm. Again, for posterity, here are nine views of this pipe: 1, 2, 3, 4, 5, 6, 7, 8, 9. As I noted before, while not as sharp as the other set, these photographs surpass most of what one finds on many, many museum sites, where the rule seems to be: offer a single view of an object, offer it at low resolution, do not allow direct hyperlinks to the file, and break the URL as soon as possible. Front view of panel pipe. I occasionally complain about the lousy pictures that professional organizations put on the web. I guess I should know that when you have something to sell, you put it’s best face forward; when you don’t, you might not care as much. 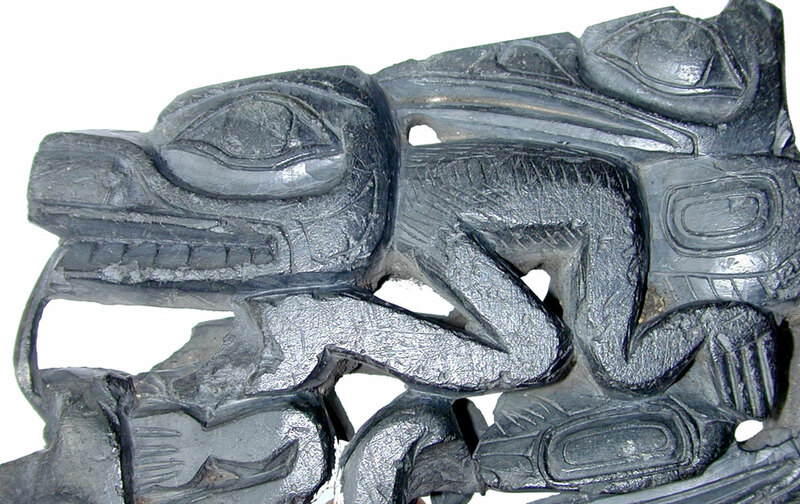 Check out the high resolution pictures of this Haida argillite pipe for sale (4,800 GBP). Multiple angles of the pipe, each one sharp and crisp: you can see each stroke of the knife and the grain of the slate. Yes there is some glare but the images are much better than most museums make available on the web. Amazing stuff. 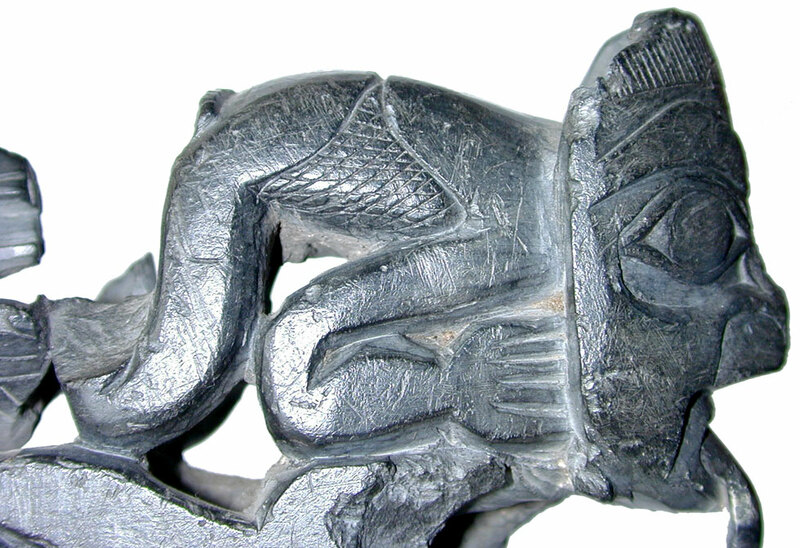 This pipe was brought back and formed part of the collection of John Madden (1837-1902) of Hilton Park Clones Co, Monaghan Ireland, he left the Irish family estate at the age of 24 to travel by horse across the eastern states of America as far as the Great Lakes just before the start of the Civil War. During his later travels between 1870-1890 he is known to have reached British Columbia where he bought this pipe, it stayed in the family home until the collection was sold at an auction of part of the contents of Hilton Park on the 8th July 1985 where this item was aquired. For the record, here are the seven views offered by the dealer: 1, 2, 3, 4, 5, 6, 7. 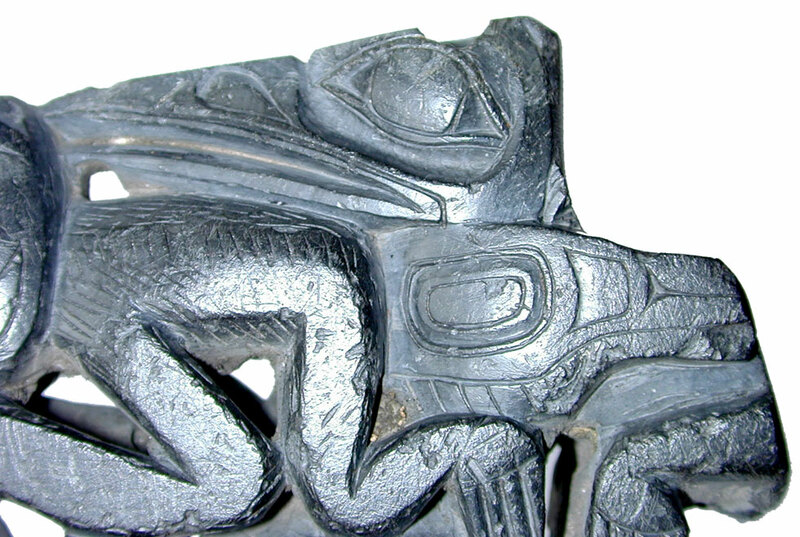 Haida Pipe: detail as if looking down the stem to the bowl. 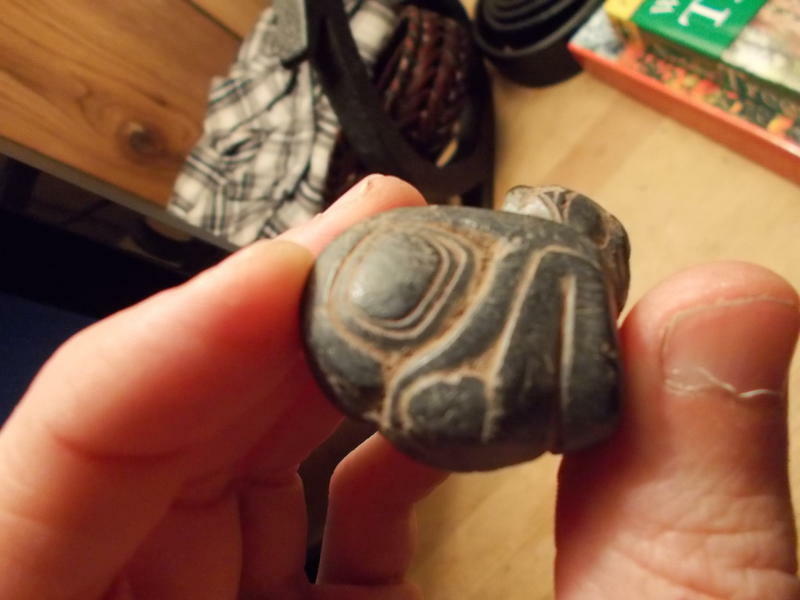 Carved argillite from Belle Vue Sheep Farm, San Juan Island. Source: NPS. I don’t know as much about the 1859 Pig War as you might think, having spent an awful lot of time on San Juan Island. This “war”, which was more of an armed standoff between British and American troops, was a key event in the various mid-19th century boundary disputes. One key location was Belle Vue Sheep Farm, near the southern tip of San Juan Island, where there has recently been some interesting historical archaeological work by the U.S. National Parks Service. 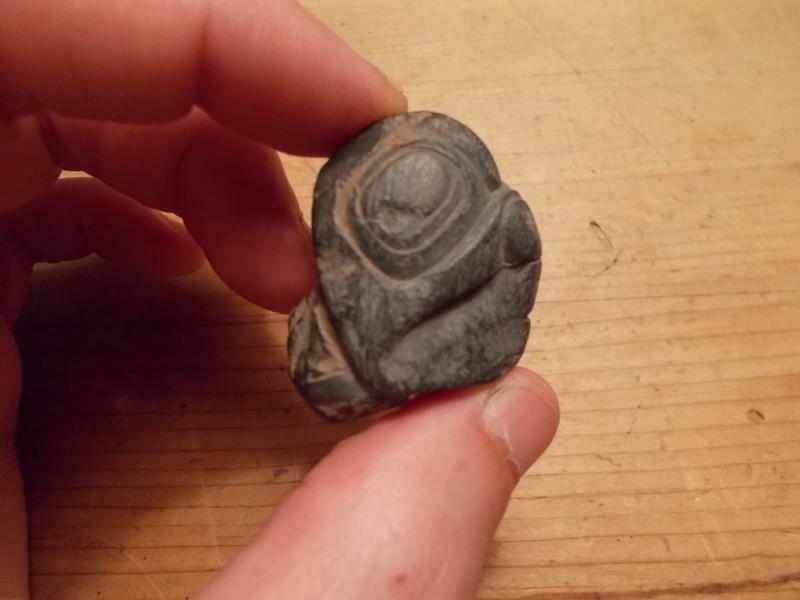 One interesting find at this dig is a piece of carved argillite, shown above, which most likely stems from Haida Gwaii (see page 7 of this PDF report, browse other NW NPS reports here). 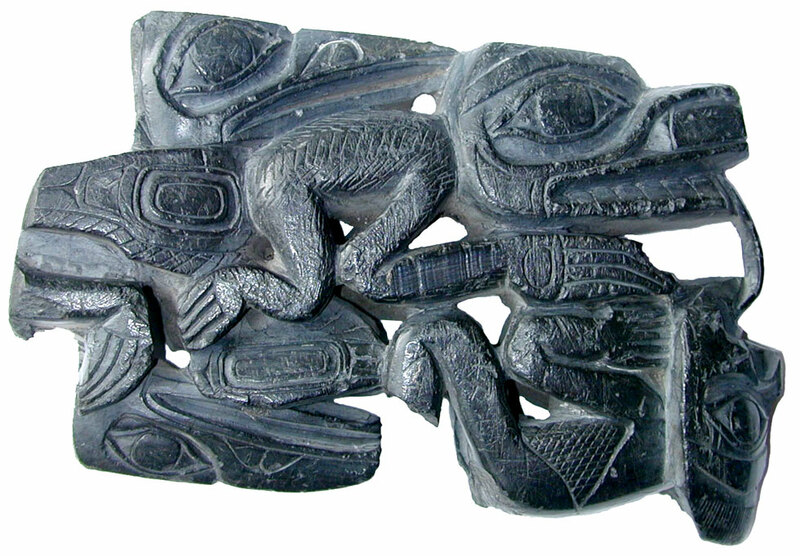 Around this time there were plenty of Haida and other North Coast Nations around the Victoria area, and so it is not surprising, really, to see this piece. And yet, it is also a stroke of massive good fortune to have such a distinctive piece of the turbulent 19th century history of First Nations. Ironically for someone who later fought for the racist Confederacy, Pickett was once married to a Haida woman by the name of Sâkis Tiigang. (More often known as “Morning Mist”, this site gives her Haida name as beSakkis Tiigang while the Pickett Society in a detailed article gives her the slightly more authoritative-seeming name Sâkis Tiigang, meaning “Mist Lying Down”). They had a son together, the artist James Tilton Pickett who, without wanting to generalize overly, certainly looks like a Haida man. Shortly after the birth of young James in 1857, Sâkis Tiigang passed away. Probably there is no tangible connection between Morning Mist/Sâkis Tiigang and this carved piece of her homeland, but surely there is a poetic one. James Tilton Pickett, son of Sâkis Tiigang and George Pickett/ 1857-1889. Source: Pickett Society. 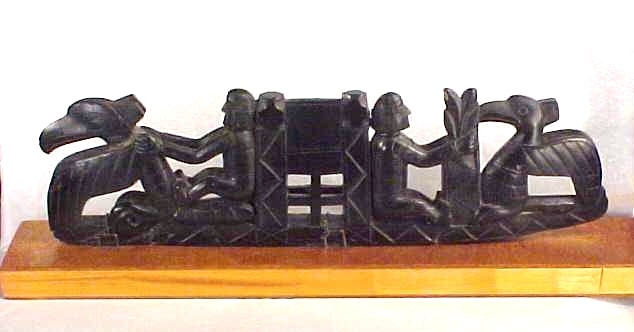 Haida Pipes, 1837. From U. Washington Collection. 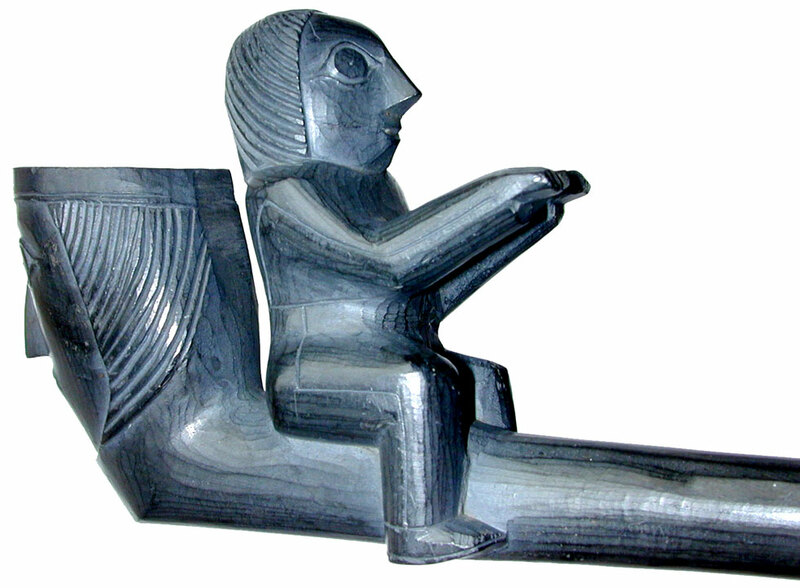 I don’t know much about these early historic Haida argillite pipes. These ones are illustrated in Edward Belcher’s Narrative of a voyage round the world, 1843, v.1, p. 309. The lower one captured my attention, with its representation of a conveyor belt (?!) – or, more likely, a block-and-tackle/pulley setup. The playful seriousness of these pipes is astounding – as can be seen in my earlier post on the SS Beaver pipe. I would like to see a photograph of this one but I have no idea where it may have ended up. The image is via the superb University of Washington Digital NW collections.